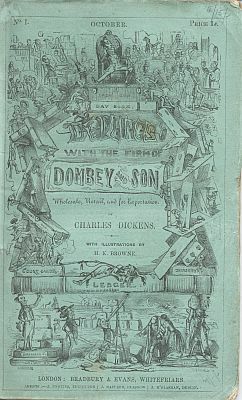 Dealings with the Firm of Dombey and Son (better known as Dombey and Son) was the first novel that Charles Dickens published with Bradbury and Evans. It was originally published in serial form between October 1846 and April 1848. The novel tells the story of Paul Dombey, powerful head of the House of Dombey. He wants a son and when a daughter (Florence) is born he despises her. His second child, a son (Paul), is weak and sickly and dies a child. Paul's first wife dies with the birth of Paul Jr and he remarries. The book follows him through troubles with family and the business. The final chapter sees Dombey now a white-haired old man, 'whose face bears heavy marks of care and suffering; but they are traces of a storm that has passed on for ever, and left a clear evening in its track'.